6-year-old Iwannabejustlikeu was injured in the 2nd at Batavia August 3 and underwent surgery. On August 20, “she was found in duress” – euthanized. 5-year-old Tighten Up was “pulled up” in the 3rd at Yonkers August 19. On-track exam revealed shattered leg – euthanized where he lay. New York’s 2016 Death Toll stands at 69. THIS IS SO SAD I REALLY NEED TO FIND SOME WAY IN HELPING TO PREVENT THINGS LIKE THIS …. THIS INDUSTRY IS SO HARD ON ALL HORSES…. How can this be happening in 21st century America – how? Two reasons are delusions and silence. The delusion that all is well covered-up with fancy hats, mint juleps, and party atmosphere. The silence that so many people must adhere to in order for abuse to continue. So sorry for yet more victims IWANNABEJUSTLIKEU. The name is so ironic -isn’t it? Nobody would want to be just like you – DYING in the dirt. SosorryforU would be more appropriate. TIGHTEN UP sustained a shattered leg. Shatteritup would be more appropriate. GITONBOB poor dude DIED at the hell hole called Finger Lakes. So sorry for you. I hope Finger Lakes will be the first victim of decoupling in New York because the casino down the street should take most of their profits leaving them in the lurch. Hopefully, Gov. Cuomo will not cave in to their ILLEGAL and unreasonable demands for MILLIONS to compensate them for the casino up the street. I have a name for Finger Lakes – middlefinger4U. How’s that for a name? Batavia is a Standardbred track. Are they including. Standardbred in their statics? Cause that changes things. How exactly does that “change things”? It changes nothing. Not a thing. Horses are still dying in the dirt, and the industry is still policing themselves. 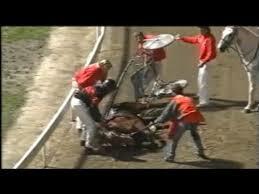 Standardbred or thoroughbred…they are still dying. I wondered too…is this the first time you’re including harness track stats? I have been reporting harness deaths since the beginning. The fact that racehorses are dying is no mystery – no secrets, and neither are the “why’s” because reputable equine studies prove that catastrophic breakdowns (DYING) are a direct result of doping to subdue and cover-up chronic issues; to keep horses filling races, and generating obscene profits for the wagering outlets. The American racehorse is now a walking dope factory for the most part. Then Lasix. This is the most widespread and commonly used drug in horse racing today. Studies have proven that it does much more harm than good, and that it’s a performance enhancer. The horse racing industry is solely responsible for their own demise. They permitted multiple drug violating Trainers who have multiple racehorses die in their care literally dominate this industry. Instead, they should have kicked them out a long time ago. The majority of stallions in Kentucky are coming from these multiple drug/death Trainers. Since the medical records are considered “private,” then nobody can really see exactly what the racehorses raced on, and that’s just the beginning. Nobody has a clue what drugs could possible be transmitted into their foals. Add into the mix illegal drugs that we don’t even know about, whipping a racehorse when tired and/or sore, and permitting horses to enter that are so obviously abused. This is all part of the delusion. There is no transparency. No neutral oversight. Like Patrick said on another post which pretty much sums up here what I said, and I paraphrase: Dying is INHERENT in the horse racing business. This will never stop. The three “D’s” of horse racing are: Doping, Dying, and Dumping. This is a legitimized animal cruelty circus, and death camp. It needs to shut down now, and our governments need to stop financially supporting this antiquated business model that is based on the exploitation of a racehorse. I stopped watching the races years ago. I just can’t bear to witness another beautiful horse fall. The entire business is nothing short of abuse. These animals shouldn’t be ridden until they are 3 or 4 when their bones are fully formed. Instead they are half way through their career (if they live) or dead. It’s like sending a 6 year old human to a gym for heavy weight lifting and body building. Ridiculous! .people in general just don’t care ….its all about the $$$…shame ..in time there wont be horses for our grand kids to see or touch…we need to get involved in stopping the pain and suffering of these animals and educate the public …id hate to see my grand kids ..their kids not ever knowing the smell of a horse ..the soft sound of their nicker as they see you walk into the barn ..thier personality when they are begging for goodies …breaks mu heart hoe these animals all thru history..who got us here pulling the wagons and artillery in the wars ..are just trash now to people …….and don’t get me started about the mustangs and the BLM round ups and where most of them end up…thats another shameful thing ..that makes me cry..